Is There Too Much ZT in True? I realize you have a thing for zero tolerance stories. I have my own ‘thing’ against them too. But as a teacher, I get tired of hearing the same negative things being emphasized all the time, especially when I see so many positive things happen in my own experiences. How about a ‘zero tolerance success’ stories page? I do know you respect at least some teachers. I am just getting tired of working my tail off only to hear negative things all the time about them. Of course, there are some bad eggs out there. But I know of many who are good eggs who really make a difference in the lives of their students. I respect any diligent, honest person in any job field. Too many of them don’t get recognized either. Laine, True isn’t about the wonderful things that teachers (or cops or politicians or…) do, it’s an exploration of the human condition using stories about “weird” events, which often means stories about the stupid things people do. Still, teachers are rarely discussed in ZT stories in True, because it’s usually not teachers who are invoking ridiculous ZT policies. Rather, the stories generally mention school administrators, principals, superintendents or other “officials” who are. 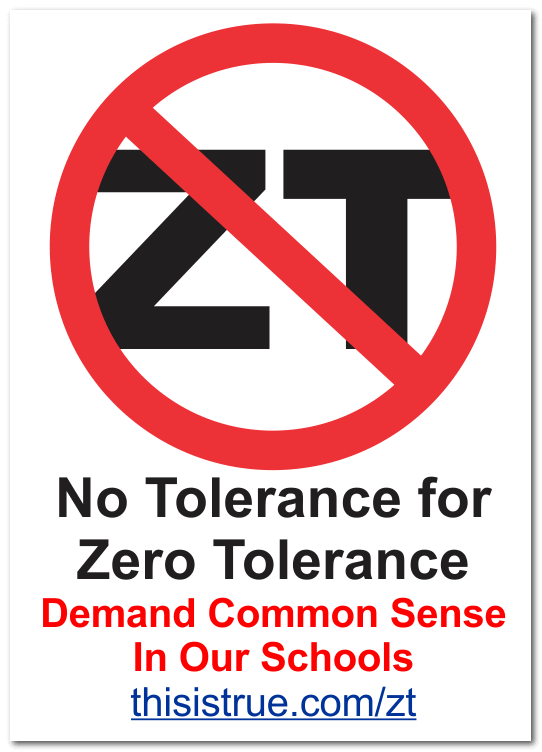 ZT has a reasonable-sounding premise: it’s reasonable to punish kids who bring illegal drugs or actual weapons to school. But Kool-Aid isn’t a drug, and a drawing of a gun isn’t a weapon, yet we’ve seen case after case of school administrators not just suspending, but expelling kids for committing such “infractions” as having candy (“Eeek! Looks like drugs! !”) or a crude drawing of a gun (“Eeek! A ‘facsimile’ weapon!!”). Expelling a kid for bringing a loaded 9mm to school? That’s not weird, that’s reasonable. But why do we need a ZT policy for that? It’s already a crime. A list of zero-tolerance success stories would be short. I’m a school teacher myself (6th grade special education) and I’ve seen enough of zero-tolerance policies to know they don’t work. Nor are they usually real zero-tolerance policies, because administrators don’t want to follow the zero-tolerance nonsense, either. That means many things get handled informally. That’s fine, except that the ZT policy is still there and can be applied to prop up lousy or biased decisions later if a teacher or administrator sees a need. Every story of ZT is a success story, but none more successful than the reign of Vlad the Impaler. His obedient citizens enjoyed a tranquil and peaceful existence as a result his ZT. There was no crime, sedition or unrest. No overpopulation problems, no shortages of consumables. The capital city even boasted a solid gold, gem encrusted drinking cup at the public water fountain that was never stolen during his reign. Although it is fiction, Monty Python’s “Happy Valley” depicts a kingdom populated solely with happy people. The discontents and grumblers were all put to death, along with the trade union leaders. Both Wise King Otto and Vlad the Impaler realised the enormous financial benefits of not having to maintain due process. The judiciary system costs billions, ZT costs nothing. Every instance of ZT however trivial, saves money. Is there any better way to measure success?